I've compiled a few sentences about each Hackaday article I've written this week. Rather than dedicate a whole day to talking about how I selected and wrote about it, I will just write once a week and link to the articles I found interesting enough to write about. The Thought Emporium released another cool video. 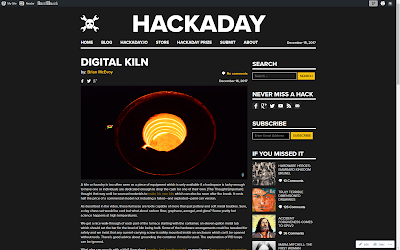 This time it was about making a digitally-controlled kiln. What impressed me was the variety of things which can be made with a kiln. Maybe the best part is that the controller is an off-the-shelf temperature controller. This means there's no need for programming, yet, it would be pretty easy to integrate custom parts for a more versatile build.